Elwyn, Santa's oldest elf, enjoys making toys for all the little girls and boys. Unfortunately, this year Elwyn is too late in finishing his toys, and Santa has already left for the North Pole. Luckily, Blitzen, the oldest reindeer, takes Elwyn and his toys and delivers them. 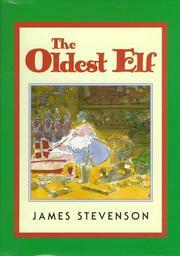 Stevenson, James, “The oldest elf,” Children's Picture Book Database at Miami University, accessed April 25, 2019, https://dlp.lib.miamioh.edu/picturebook/items/show/9718.